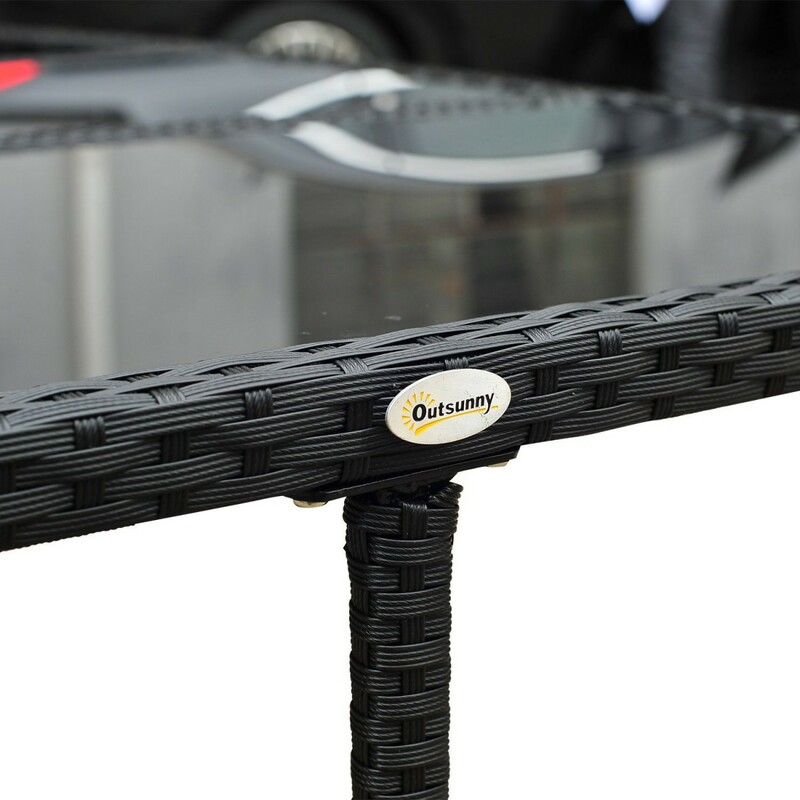 The Outsunny 11 Piece Rattan Cube Space Saving Outdoor Dining Set is a cleverly-designed, dining/entertaining set that provides flexible seating for six to ten guests — and after which, its six included chairs, four ottomans and abundant cushions all stow away underneath the table, to form a neat, compact rectangle that saves space when not in use. 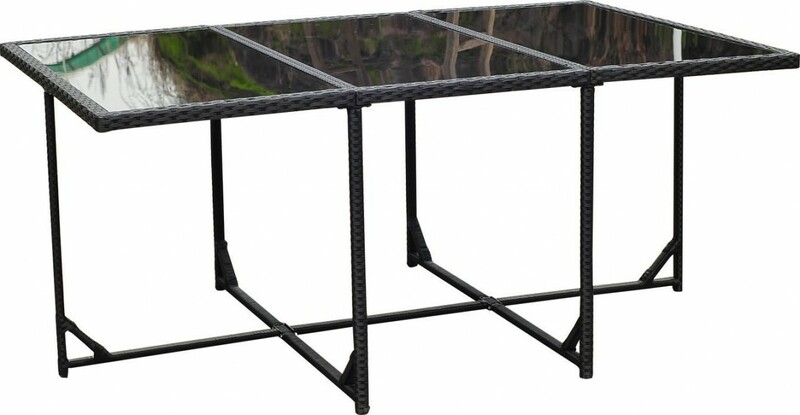 Made of a light, but tough aluminum frame, and strong, black, PE rattan wicker, the Outsunny 11 Piece Rattan Cube Space Saving Outdoor Dining Set boasts a strong and durable construction that is designed to stand up to the elements — especially when stowing away the chairs, ottomans and cushions under the table when not in use (which keeps them dry and protected). 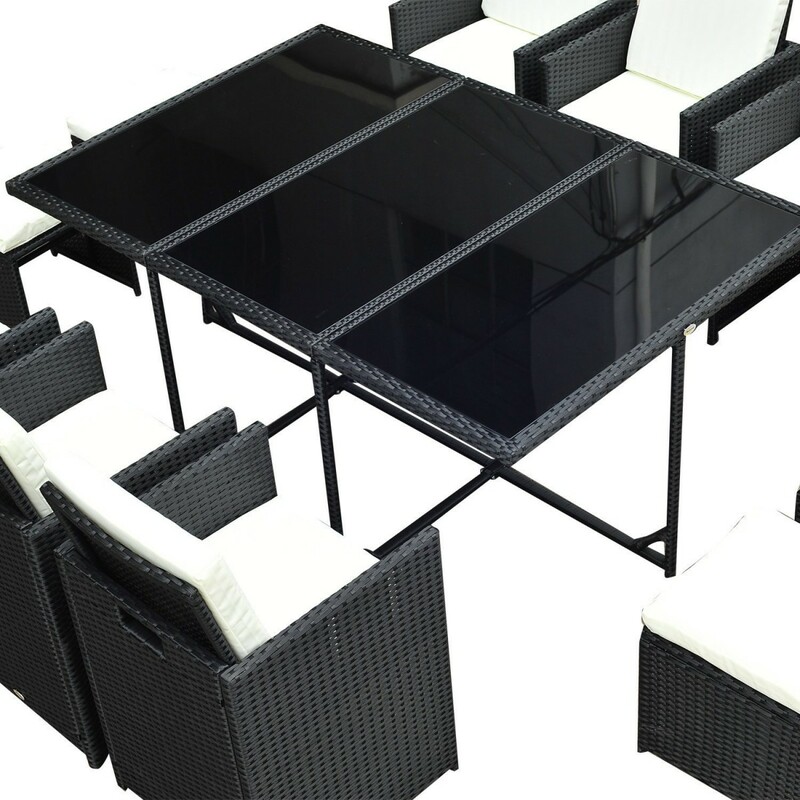 Including a large, rectangular table and six armchairs, the Outsunny 11 Piece Rattan Cube Space Saving Outdoor Dining Set comfortably accommodates up to six adults for a lovely spot of al fresco dining — or for more casual get togethers, serve up some drinks and pull out the set’s four included ottomans, to let your guests really put their feet up (or to provide extra seating capacity). 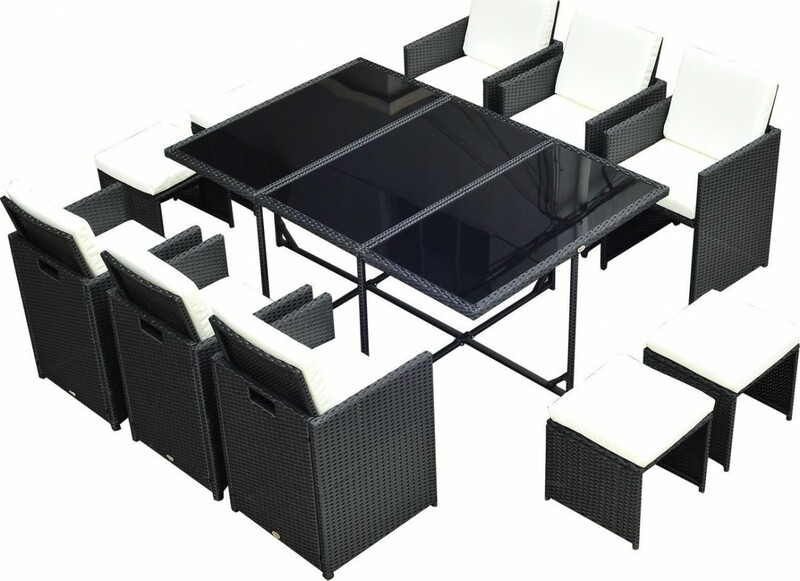 Fitted with 5.1-inch thick cushions for extra comfort and support, including six backrest cushions, six seat cushions and four ottoman/footstool cushions, the Outsunny 11 Piece Rattan Cube Space Saving Outdoor Dining Set also boasts high-quality, cream/white-colored, water-resistant, stain-resistant cushion covers — which can also be unzipped and removed for easy washing if required. 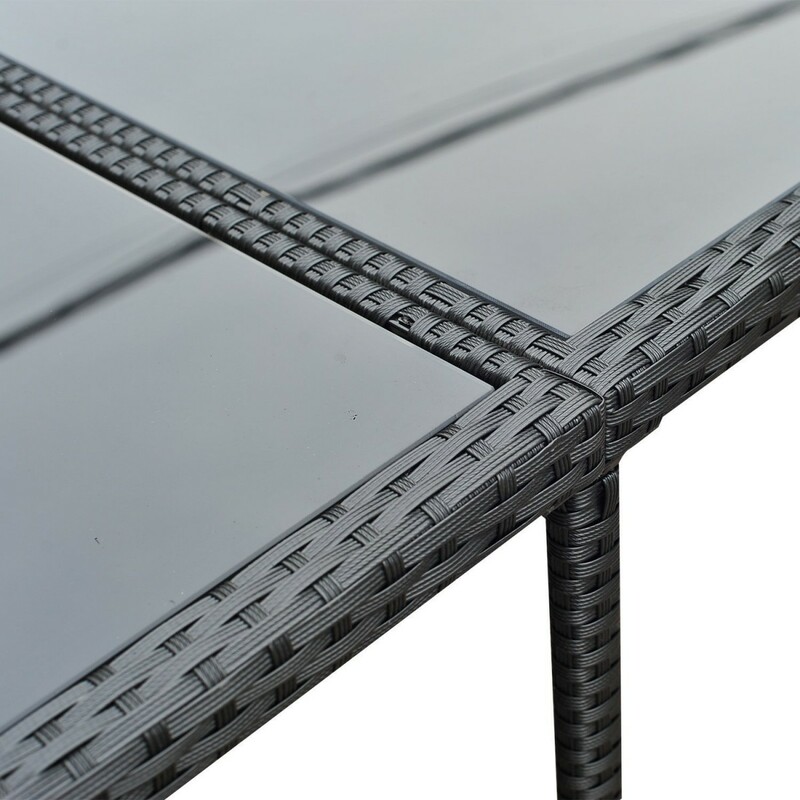 Including a 5mm thick, toughened, transparent glass table top to protect the table, and to ensure a smooth, level surface for your wine glasses, the Outsunny 11 Piece Rattan Cube Space Saving Outdoor Dining Set will add a touch of contemporary style to your patio, backyard or garden with its elegant, two-tone colour palette, and its complementary mix of traditional and modern materials. 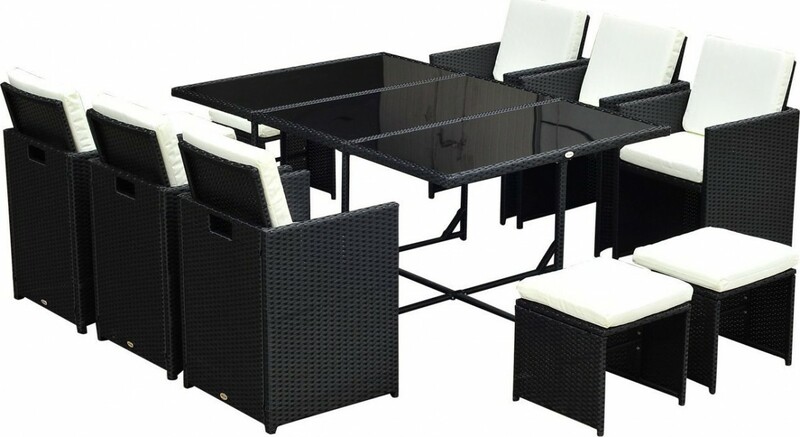 With simple assembly (ratcheting Allen tool provided), and unique, super-sharp looks, the Outsunny 11 Piece Rattan Cube Space Saving Outdoor Dining Set is sure to receive many compliments from friends and neighbors (especially when they see how neatly it tucks away), and is available over at Amazon.com (rated 4.2 out of 5 stars from 10 customer reviews) with FREE shipping. Click to see current price.